Rough seas are the story of the day. I woke up with a start this morning at 4am with a huge roll that nearly threw me from my bunk. 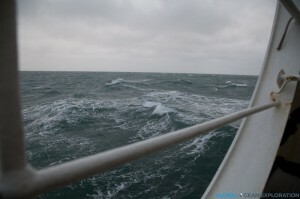 It is blowing more than 30 knots and building with 10-12 foot seas and the Healy is rocking and rolling. In conditions like these, scientific operations stop and we just have to wait out the weather. I have to say that the ocean looks magnificent in power and fury, but walking to the lab this morning, I felt like I was nearly going to blow away. Despite the storm, the Ross’s Gulls were still soaring among the waves along with a few other Arctic birds. Not a great day to do science, but so awesome to witness seas like this firsthand!